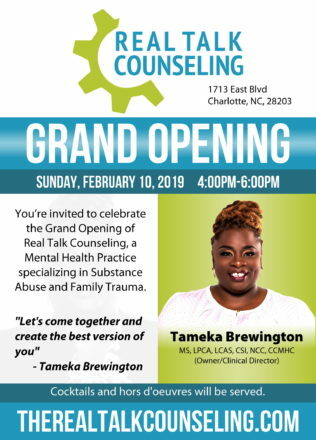 Real Talk Counseling will host its grand opening celebration for their brand-new office location on February 10 from 4:00 p.m. until 6:00 p.m. at 1713 East Blvdin the Dilworth neighborhood near Uptown Charlotte. The owner, Tameka Brewington is a dually licensed psychotherapist in North Carolina who has been working in mental health and substance abuse for the past 20 years. She founded Real Talk Counseling in January 2019. Self-care is more than a buzz word, it’s essential to healthy living—and therapy is an integral component to self-care. Real Talk Counseling is here to help people realize their dreams and live their absolute best lives. Brewington’s therapeutic process is all about making strong connections with her clients to make them feel safe and supported during the entire process. Brewington’s core competencies and areas of interest include women’s issues, working professionals and adolescents, with a specialization in substance abuse and trauma. Her credentials and accolades include being a Licensed Professional Counselor, Licensed Clinical Addiction Specialist, Clinical Supervising Intern, Nationally Certified Counselor and a Certified Clinical Mental Health Counselor. Recently she has joined the academic staff at Central Piedmont Community College as a professor leading the substance abuse certification program. Additionally, Brewington serves on the board for Present Age Ministries, a local nonprofit organization that is committed to combating sexual abuse, exploitation and trafficking of teen girls. Brewington will collect donations during Sunday’s grand opening event to support Present Age’s programs and services. Tax -deductible donations can also made online via presentageministries.org or by mailing a check to Present Age Ministries, P.O. Box 700, Harrisburg, North Carolina 28075. 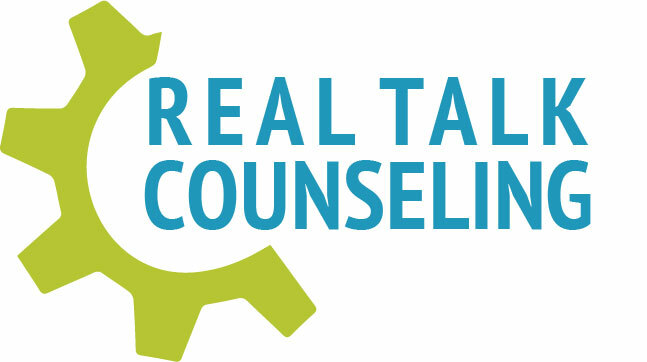 The Real Talk Counseling grand opening celebration is open and free to the public. There will be music, light hors d’oeuvres and cocktails as well as the opportunity to meet Brewington and her staff. For media inquiries or to schedule an interview with Tameka Brewington, contact Jameka Whitten at 704.965.3297 or jameka@jswmediagroup.com. On-site interviews will also be available. To learn more about Real Talk Counseling or to schedule an appointment, visit therealtalkcounseling.com.